Galley Wench Tales: Day 17: Secret’s Out! A harbor cruise through this protected and not-so-Secret Cove’s long fingerlike passages offers a great way to see how the other half lives … lots of attractive summer homes, touting fancy gadgets like a dock to boat house boat escalator. 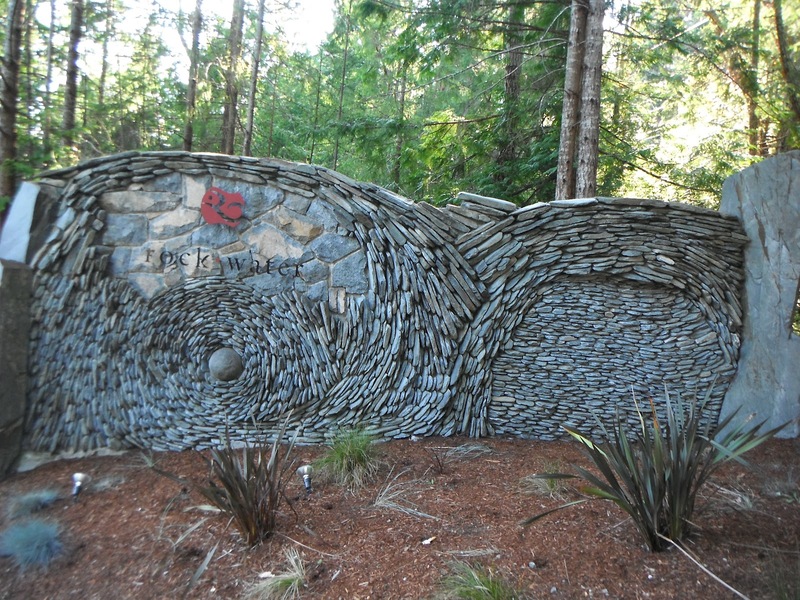 The cove is touted as a “must see;” we disagree. While well protected, we simply didn’t find anything all that interesting compared to other anchorages, especially for those of us seeking a more rugged outdoor experience. We anchored, and were amused by the 45-minute anchoring shenanigans of a neighboring orange-hulled sailboat, “Halloween. 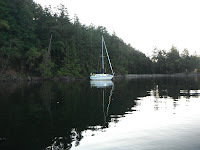 “ The anchor went down, the boat drove forward over the anchor, and around. Pulled it. Went elsewhere, then after much ado, once more dropped anchor. This time they stayed, and to our relief, didn’t budge as they were close and seemed to drop all their chain (at least it was chain) “scope” in one spot. We dinghied over to the marina, got fresh ice (true to Kyle's promise, Toba Wildernest ice was holding up well), and took a walk. Our turnaround point was the upscale resort, Rock Water. Linen tablecloths graced their harbor / poolside view restaurant. Private cabins and tent cabins sprawled across their artfully landscaped grounds. Our return was an easy downhill amble. Dinner was uncomplicated and tasty -- refried beans, melted cheese and chicken burritos with cream cheese and salsa. 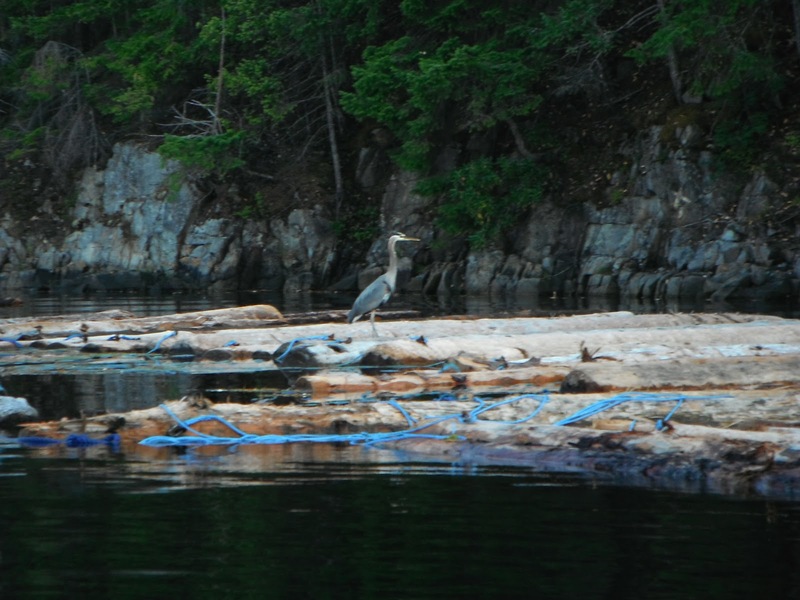 A handsome heron hung out on a nearby log boom, unperturbed by my camera. Even posing, perhaps. Tomorrow: our last night in Canada.